We already have a controversial Replay Review decision in the top of the 1st inning of the Yankees-Rays game, so there's plenty to talk about—and we're less than an hour into the 2017 season. 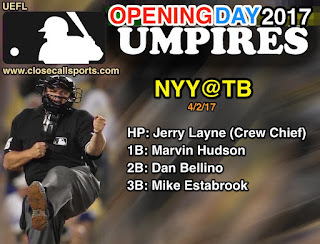 We will have replays and analysis of this and any other close plays that might occur during this first day of the regular season, as well as plate umpire performance, including ball-and-strike accuracy figures. Discuss these & other Opening Day (Sunday & Monday) topics of interest in this Opening Day Discussion! - 4/2, NYY@TB: Jerry Layne: pfx (38/45 Called Strikes + 97/100 Balls = 135/145 = 93.1%). - 4/2, SF@ARI: Greg Gibson: pfx (44/48 Called Strikes + 101/104 Balls = 145/152 = 95.4%). - 4/2, CHC@STL: TBD: Paul Emmel: pfx (43/50 Strikes + 136/139 Balls = 179/189 = 94.7%). - 4/3, MIA@WAS: Jerry Meals: pfx (45/48 Strikes + 80/89 Balls = 125/137 = 91.2%). - 4/3, ATL@NYM: Jeff Kellogg: pfx (43/48 Strikes + 108/115 Balls = 151/163 = 92.6%). - 4/3, PIT@BOS: Dana DeMuth: pfx (40/42 Strikes + 94/100 Strikes = 134/142 = 94.4%). - 4/3, COL@MIL: Joe West: pfx (44/48 Strikes + 106/116 Balls = 150/164 = 91.7%). - 4/3, TOR@BAL: Gary Cederstrom: pfx (56/61 Strikes + 125/132 Balls = 181/193 = 93.8%). - 4/3, SD@LAD: Larry Vanover: pfx (46/50 Strikes + 89/91 Balls = 135/141 = 95.7%). - 4/3, PHI@CIN: Tom Hallion: pfx (35/45 Strikes + 109/115 Balls = 144/160 = 90.0%). - 4/3, DET@CWS: Brian Gorman: POSTPONED. - 4/3, KC@MIN: Gerry Davis: pfx (40/42 Strikes + 109/114 Balls = 149/156 = 95.5%). - 4/3, CLE@TEX: Mike Winters: pfx (54/59 Strikes + 113/120 Balls = 167/179 = 93.3%). - 4/3, SEA@HOU: Jeff Nelson: pfx (40/42 Strikes + 90/92 Balls = 130/134 = 97.0%). - 4/3, LAA@OAK: Ted Barrett: pfx (46/55 Strikes + 109/111 Balls = 155/166 = 93.4%). - 4/2, NYY@TB: 1B Umpire Marvin Hudson's out call stands in the top of the 1st inning. - 4/2, NYY@TB: 1B Umpire Marvin Hudson's safe call stands in the top of the 2nd inning. - 4/2, SF@ARI: 3B Umpire DJ Reyburn's safe call is overturned and the runner is out in the 6th. - 4/2, SF@ARI: 1B Umpire Tim Timmons' out call stands on pickoff play in the 7th inning. - 4/2, CHC@STL: 2B Umpire Quinn Wolcott's out call (non-pulled foot) stands in the 7th. - 4/3, ATL@NYM: HP Umpire Jeff Kellogg's out call is overturned to allow game's first run in 7th. - 4/3, COL@MIL: 1B Umpire Hunter Wendelstedt's out call is confirmed for a game-ending double play. - 4/3, KC@MIN: 1B Umpire Tony Randazzo's out call is overturned for a bunt single in the 7th. - 4/3, SD@LAD: 3B Umpire David Rackley's fair ball call stands after borderline-legal review. - 4/3, CLE@TEX: 2B Umpire Marty Foster's out call on SB attempt stands in the 1st inning. IR Totals: 3 Overturned, 1 Confirmed, 6 Stands = 70.0% Replay Affirmation Percentage (RAP).